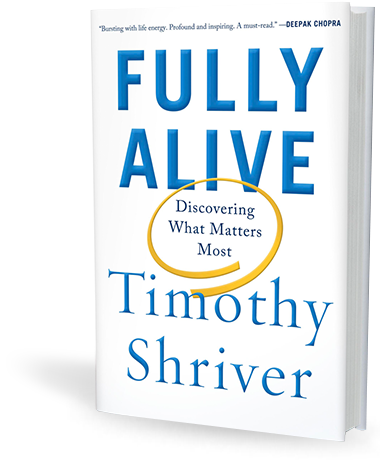 Buy the Book "Fully Alive"
Tim Shriver provides exclusive excerpts from his book Fully Alive. In fact, they tried to hide Rosemary’s condition not only from the public but from their own close friends, and even from Rosemary herself. There would have been people in their social circles who might have whispered about “bad blood” in the family had the fact become known. They also believed that Rosemary would be happier if kept unaware of how different she was. In practice, the strict code of silence led Rosemary to become confused and frustrated when she could not keep up. Still, she consistently wrestled with dark moods and impulse control, and her parents became increasingly anxious about her future. Fierce and impatient when frustrated, she began to act out again. She was often angry and sometimes violent. “She was upset easily and unpredictable,” wrote my grandmother. “Some of these upsets became tantrums, during which she broke things or hit out at people. Since she was quite strong, her blows were hard.” At the time, yet another new possibility for “fixing” Rosemary was gaining adherents: the lobotomy. …My grandfather must have emphasized Rosemary’s rages and rebellious wanderings when he consulted with [her doctor]. To the end of her life, my grandmother would maintain that this assessment was correct: “A neurological disturbance or disease of some sort seemingly had overtaken her, and it was becoming progressively worse.” My grandfather chose to listen to the advice of experts. He scheduled a lobotomy for Rosemary— without telling my grandmother or any of his other children. The outcome, in Rosemary’s case, was devastating….After a few weeks, it became apparent that she had been robbed of her speech and of significant cognitive capacity. At some level, they must have realized that in their sister Rosemary, they had received something far greater than they had ever been asked to give: a person whose love they didn’t have to earn. With Rosemary, they needed only to give love in order to receive it back. …In the midst of an enormously competitive and political family system, Rosemary Kennedy lived a full life to the age of eighty-six without ever giving a speech, writing a book, holding a job, or garnering the praise of the mighty. Despite failing to meet any of the expectations that were imposed on the rest of us, she belonged . . . Her presence changed everything. For years after meeting Robert Kennedy, Rafer Johnson was on call to him, traveling with him, visiting him and his family, joining his mission to change the politics of the nation. And then, just five weeks before the first Special Olympics, Rafer was with Bobby Kennedy when he lost his life in Los Angeles. Along with NFL great Roosevelt Grier, Johnson held on to the gun that killed my uncle until the police came to take it. But he did answer the phone one day to hear an invitation…”Would you come to Chicago?” my mother asked. Amazingly, despite the horrific situation surrounding her brother’s death, she had decided to proceed with the games. What Rafer saw at those first Games caught his attention—and changed everything. Years later, I asked her why she’d never wanted to be an official member, why she chose instead to remain an unofficial “consultant.” Why, I often wondered, had she exercised her zeal and determination in such forceful way and yet been reluctant to be named the leader? Like every effective revolutionary, she was also an observer, an experimenter, a risk-taker. In 1962, there was little consensus in the fields of science or public policy as to what, exactly, people with intellectual disabilities could do. Could they function in society outside of institutions? Could they form friendships, play sports, fall in love, hold jobs? No one knew for sure, because so few alternatives had been tested. One of Camp Shriver’s primary purposes was to serve as a testing ground, an informal scientific exploration of whether kids with intellectual disabilities could play sports and games and, if so, whether they would benefit from doing so. "He caught our hearts off guard..."
From behind the stage, a young woman came pushing Donal in his wheelchair to the center of the riser. I could see that Donal had only the most limited control of his arms and that his body was slightly contorted in the chair. But I also couldn’t help noticing the face of the woman pushing him, her broad smile, her glittering eyes as she looked out to the crowd. She was Donal’s coach. She positioned Donal in his wheelchair in front of a small table, and she came around the front to set up a small beanbag. Once she secured the chair and the bag, she leaned over to speak to him in his ear—last- minute instructions and encouragement. Donal’s challenge was to reach over, pick up the beanbag, lift it, and move it to the other side of the table. She placed her hands on his shoulders, then down on the bag as if to capture his attention and make sure he understood. With that, she stepped off the riser and headed toward the back of the stage from where she’d come. But she paused midway and turned to watch Donal perform from a safe distance. “Start,” barked the announcer, and Donal began his task. I was close enough to Donal to see his eyes, and I could see him scan the crowd with a slight hint of a smile. His gaze moved around the hall. It was as if he was taking the whole of the place into himself; as if he was saying that he wouldn’t connect with that beanbag until he’d first connected with the people around him. The crowd was quiet. He’d lived his whole life learning how to communicate without words or motions, and he was doing that right there on that stage. There were no words and only the slightest of movements. But he was gathering us, taking us in, collecting the energy in the room for the task ahead. After a minute or so, without the slightest hint of Donal’s picking up the beanbag— a minute that seemed like an hour— he turned his head downward to the task at hand and, to my relief, started to focus on completing his assignment. Silence has an uncomfortable power in a room of thousands, and while I practiced it in prayer, I was ready for it to end in the arena. And Donal, it appeared, was ready to do what he had come to do. As his hand started toward the bag, one fan in the crowd shouted an unmistakable cheer—“Come on now! Let’s see it!”—and a rustle of encouragement moved through the room. If I had been apprehensive about the MATP event before it began, I forgot all about it. The moments of silence had brought my full attention to Donal. And with my attention, I felt a bond emerge between him and the crowd of which I was a part, and I was all in, focused completely on pulling for him to pick up that bag. Donal was now leaning into the challenge, but even though he tried and tried to move his hand to pick up that beanbag, he just couldn’t do it. Another minute went by but his body simply wouldn’t cooperate. All of us assembled could tell he was giving it his effort, but there was no movement in his arm, no grasping in his fingers. Try as he might, the level of difficulty was just too high. Thousands of people were watching him and we were frozen in disappointment and empathy. He just couldn’t do it. Over the course of those two weeks in Ireland, the Special Olympics athletes amazed crowds again and again. There were so many moments of athletic greatness we couldn’t keep track. But in my mind, none of those moments outshone Donal’s. That was Donal’s gift to me and Donal’s gift to his family and to his village of Portumna and to the great nation of Ireland. He caught our hearts off guard, and with his grit and his fearless effort, he blew them open. For media inquiries, contact media@specialolympics.org.